Did you know that one in seven young Australians will experience a mental health disorder? Research suggests that individuals living with Alopecia may be at higher risk of experiencing anxiety, depression, and other mental health disorders. But there is help available, and there are things you can do to support any young people in your life. Knowing the signs, how to start a conversation and where you can get support can change the lives of young people going through hard times. 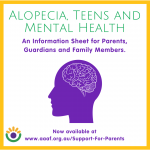 That’s why we’ve created this information sheet for parents, family and guardians of teens with alopecia. It’s available up on our website via the link below. If you or a family member are struggling right now, it’s okay. You’re not alone and there is help available. Reaching out will help, and AAAF are always here for you.